November is COPD Awareness Month! COPD stands for Chronic Obstructive Pulmonary Disease, and it is a collective term for any disease process that blocks or disrupts the passage of air through the lungs over a long period of time. Included within this term are conditions such: as Emphysema, Chronic Bronchitis, and Asthma. COPD is one of the leading causes of morbidity and mortality in the US and is responsible for 5% of deaths worldwide each year. Because of the debilitating effects of this condition, Physical and Occupational Therapists routinely treat patients with COPD in their clinical practice. Therapists are often involved in the care of these patients due to global muscle weakness, decreased activity tolerance, increased fall risk, and decreased independence with functional mobility and ADLs. For therapists, progressing this group of patients through a therapy plan of care can be a challenging and daunting task. This group of patients typically will experience decreased ability to tolerate activity due to impaired lung function as well as muscle weakness, including respiratory muscle weakness. Patients with COPD often experience shortness of breath so debilitating that they are not only unable to participate in activities they enjoy, but they are also not able to participate with their functional mobility tasks. 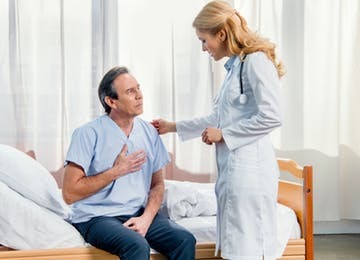 Because of the chronicity of their illness, these patients often become frustrated with health care services and demonstrate decreased compliance with health care recommendations. All of these things can lead to further exacerbations and functional decline. During my course, Rehab Strategies for COPD, Diabetes, Heart Failure and Hypertension, we will discuss the causes and pathophysiology of COPD. We will discuss common medications your patient with COPD may be taking, and what effect those medications may have on your therapeutic interventions. We will also look at several studies that give us information regarding evidence-based interventions to provide the best possible treatments for patients with COPD. The overall goals of our interventions are to minimize additional lung damage, improve gas exchange during respiration, improve quality of life and increase physical activity. Additionally, we will discuss methods in which a therapist can help to facilitate improved exercise adherence with this patient population. Working with patients with COPD can be very rewarding. As these patients learn strategies to help manage their shortness of breath, they become much better at being able to participate in their ADLS and functional mobility. Improvements in strength and endurance allow these patients to play a much more active role in their lives, including returning to activities that bring our patients joy and fulfillment. Not only have therapy services been shown to add years to life in patients with COPD, but as therapists we can help our patients add quality to those years.